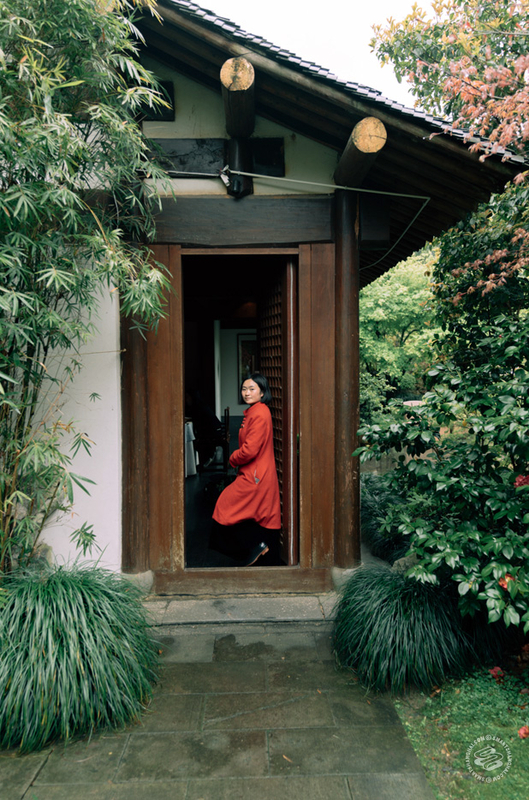 Dai Jianjun was raised on the shores of Hangzhou’s West Lake and we are sitting in his restaurant in that city's tea fields as he tells me a Chinese proverb. 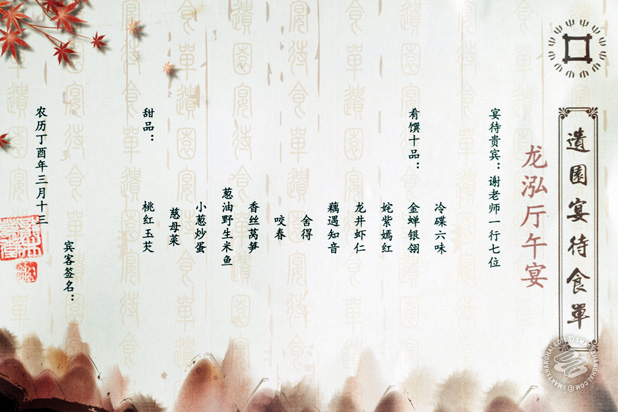 “A Dai", as he likes to be called (for his habit of fadai, or daydreaming) is the third generation. 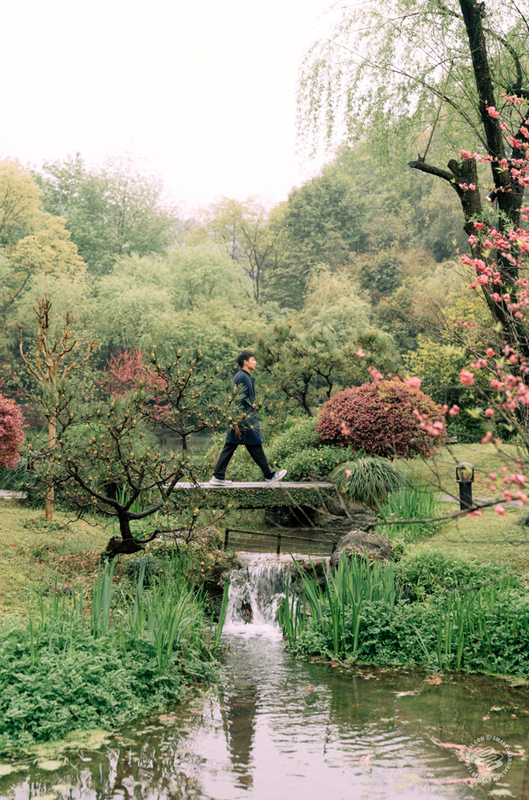 A Dai returned to China from a tour of Europe in 2000, where he traveled through small rural towns in particular, where he considered the food to be better. The idea stuck with him. Why, he asked, didn’t the food in China have the same purity of flavor as it did in Europe? Was the best stuff hiding in China's own rural areas? 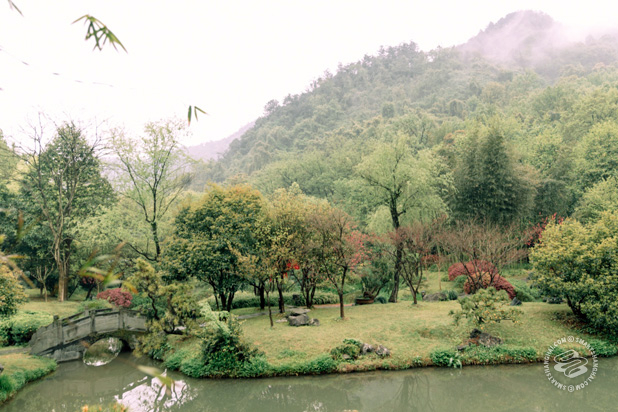 He became acquainted with a farmer named Song in the Zhejiang countryside. Song didn’t take A Dai seriously until one day when A Dai complained that that food in the cities doesn’t take like anything, sparking the farmer’s intrigue. After knowing him for a while, Song finally offered A Dai a hoe, a cigarette and a place to sit — the farmer’s acceptance. In that moment, Song turned to A Dai and offered a simple line A Dai would spend the next two decades following. To A Dai, a philosophy major, it was a revelation. 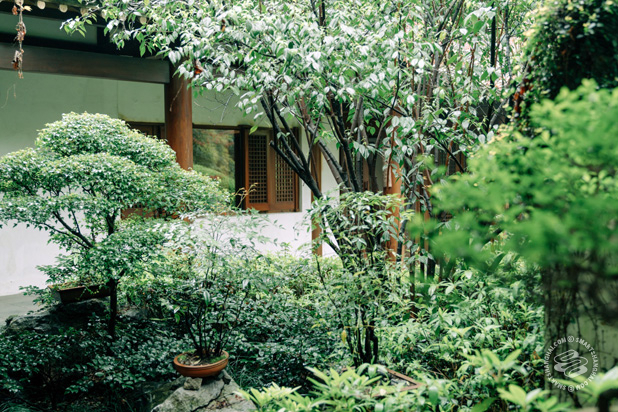 His restaurant, Dragon Well Manor, is set among an Edenic scene in the tea fields of Hangzhou’s Longjing tea district, and since a a 2008 article2008 article by Fuchsia Dunlop in The New Yorker, has become an international stop on the global food-set’s map. But in many ways, A Dai does not care for that at all. He is still pursuing the goal Song set for him all those years ago. When we first arrived at Dragon Well Manor, half an hour from the city’s train station, A Dai made a beeline for the supply books. For the past 12 years, he has meticulously detailed every fish, duck, vegetable and other food item and their farmer, grower or forager. 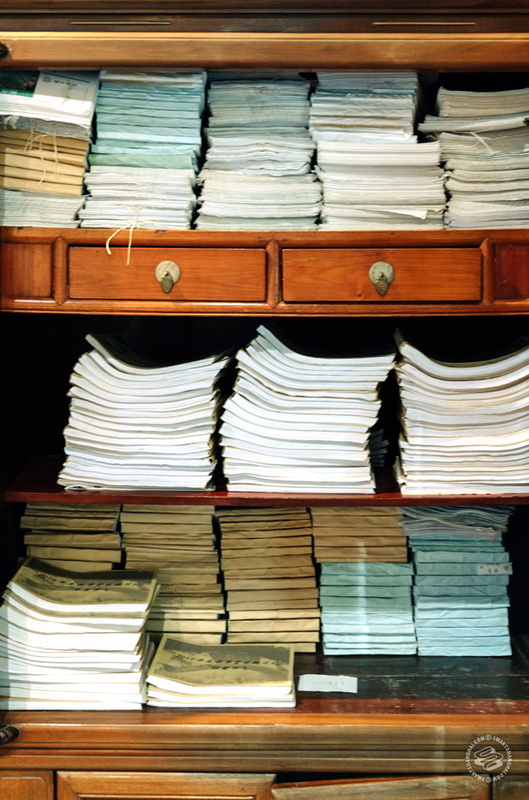 The books, each page marked with the signature of a farmer, or a thumbprint by those who can’t write, are stacked dozens high in a wooden bureau in the restaurant’s small lobby. He picked a book at random, and showed me pictures of two ducks destined for soup. We walked out to the terrace. 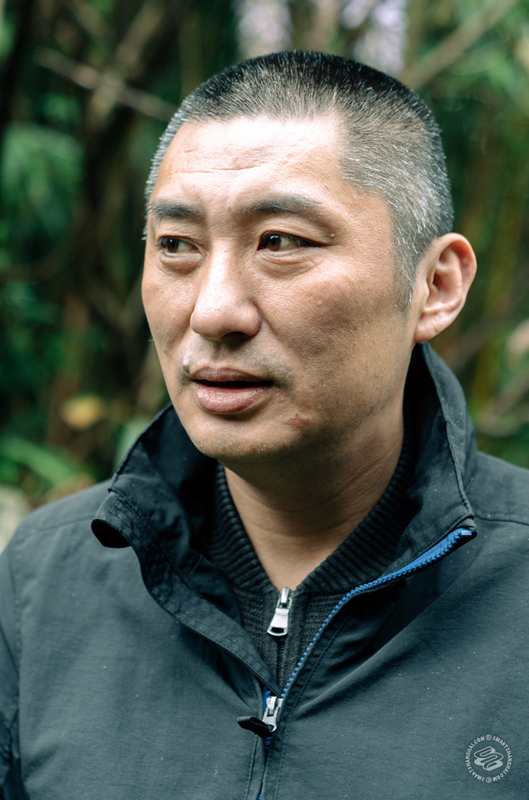 A Dai, 48, is a slight man with a buzz cut and hair beginning to gray on the sides. He stood outside in his all-black outfit and cotton monk shoes as other staff passed in their finery. For those who didn’t already know him, he could have passed as the farmer. He pulled a cigarette out of the pack and immediately apologized as he lit up. What followed was five hours with a man with a profound respect for the innate wisdom of China’s farmers, a deep thinker about urbanization, its effect on the food supply and his role in it. He preaches a simple solution, one often lacking in modern China for those who come from rural areas: respect. A Dai takes the long view. “Chinese agriculture and civilization have been feeding the motherland for more than 4,000 years”, he says. 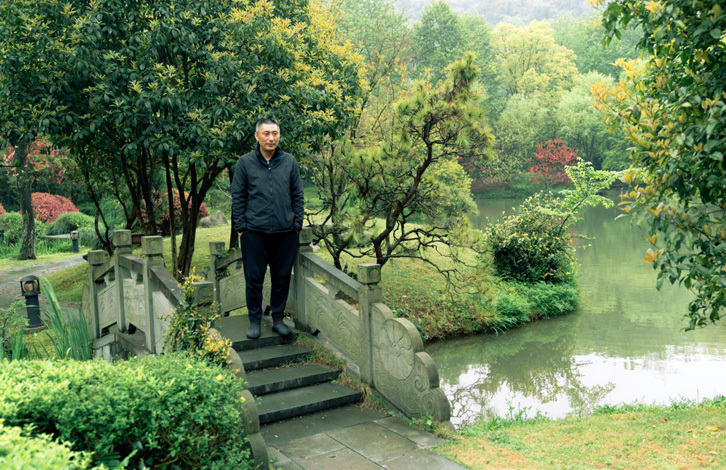 To that end, he has a 20-acre organic farm in southern Zhejiang, where he spends half his time. The members of his sourcing team work full-time scouring the countryside for the best ingredients he can find. He uses the profits from Dragon Well Manor to buy health insurance for his farming cooperative and he invites his educated friends to teach their children. He jokes that he’s robbing from the rich to the give back to the poor — with dinner at Dragon Well Manor now 1,840rmb for four people, or 3,220rmb for six to eight, the joke has perhaps more resonance than he intended. I press him about this just being precious organic food for the rich — what about the rest of the country? “The earth has a fixed capacity for production,” he tells me. “What I’m doing seems like it will feed fewer people. But when the earth meets its capacity, there are going to be problems,” he says, hinting at the food scandals that emerge year after year. It’s not a satisfactory answer but it’s as close as A Dai will get. Before we even arrive, A Dai makes clear in a text message that the restaurant’s main job is sourcing ingredients from farmers, not fancy cooking, a philosophy that goes back to Yuan Mei’s classic book Recipes from the Garden of Contentment, which proclaimed that a dinner party’s success is 40% due to the chefs and 60% due to the ingredients. 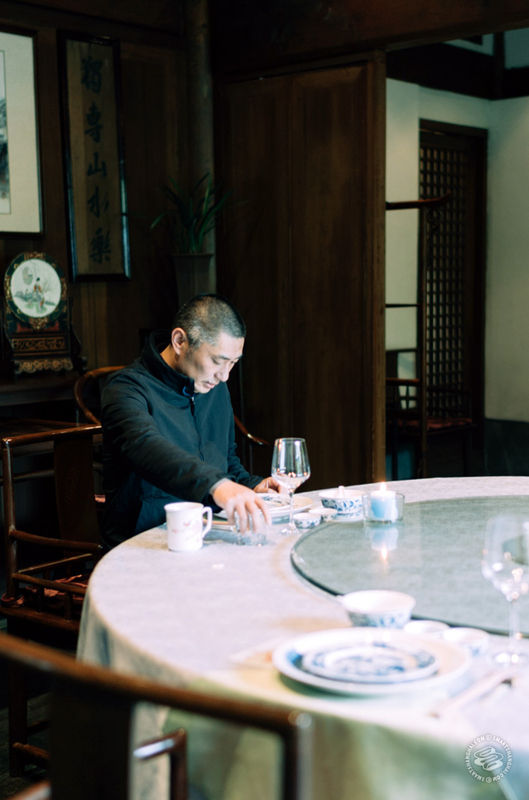 In an era where procurement-as-cuisine has already become a has-been trend in the West, A Dai is developing a parallel philosophy with deep social implications for China. The dishes start to arrive and we move from the tea table to a massive round table, big enough for 20, set for the four of us. After eating here twice before, having an idea of what to expect, and speaking to A Dai in depth, I would call the food at Dragon Well Manor glorified country cooking. The ingredients are unimpeachable. The cooking as well. Over the course of the meal, A Dai voices my private judgment. 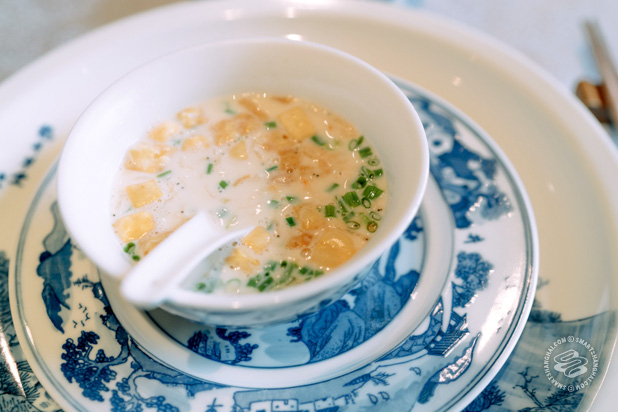 The first course at Dragon Well Manor is always soy milk, stone-ground in the Dragon Well Manor kitchens and served with some pomp and circumstance. 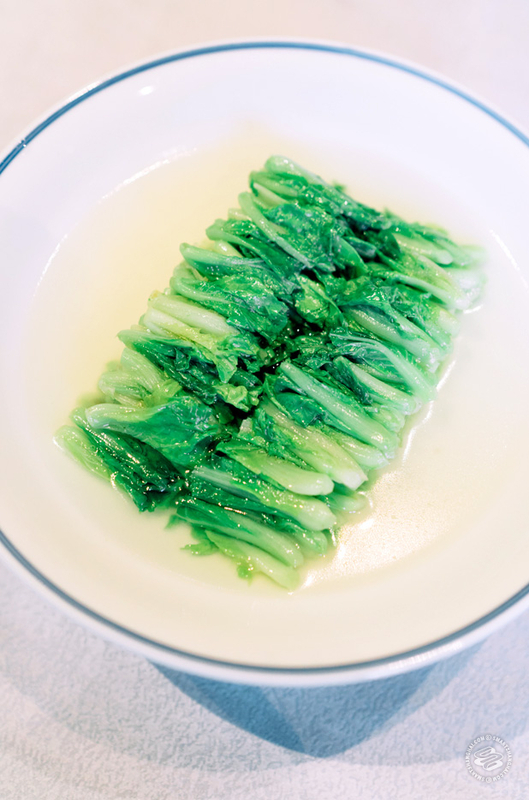 A waitress with way too many small dishes asks if you’d prefer it savory or sweet and doles out the seasonings accordingly: xue cai, pickled greens, small dried shrimp, spring onions. For A Dai, this is yet again a sign of his distrust in the country’s food system. Soy milk is his strike back against the Chinese dairy industry. It doesn’t hurt that it coats the stomach, he says, and helps absorb alcohol. Thank God we’ve come for lunch and have stuck to tea, and an oddly delicious smoothie made with black ear fungus. One of the most interesting aspects of Dragon Well Manor, and perhaps one its greatest vulnerabilities to critics, is its strict adherence to seasonal cooking and traditional methods. It was one of his first chefs, from the renowned Lou Wai Lou, who instructed A Dai to banish MSG from his kitchen and go back to the traditional ways of seasoning food – oil, salt, soy sauce, vinegar — and long-simmered compound stocks, expensive concoctions made with chicken and ham, known as gao tang. In a restaurant landscape that emphasizes maximum flavor at minimal cost, Dragon Well Manor is an expensive throwback to a time not so long ago. A bevy of other dishes follow. 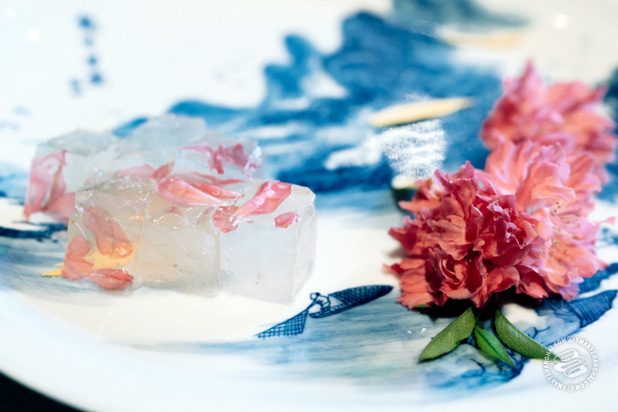 A sweetened jelly made with chrysanthemums. The season’s first snails, best around the Qing Ming festival, simply blanched and tossed with bitter greens. 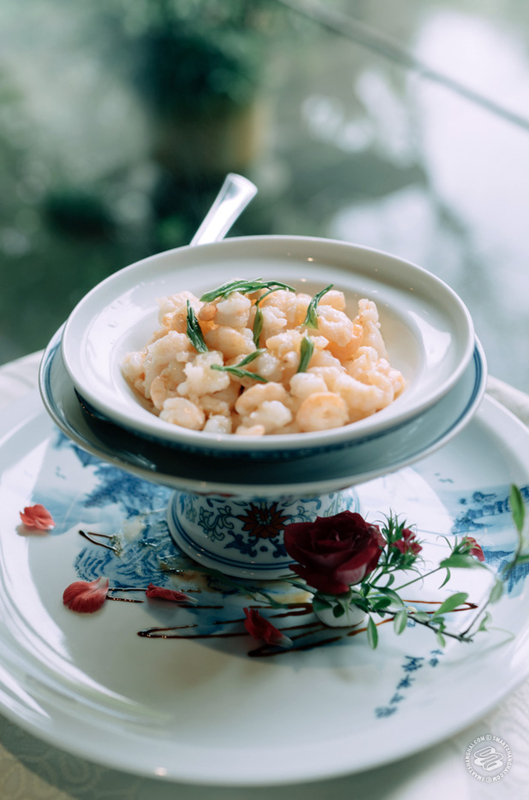 River shrimp stir-fried with Longjing tea leaves, an Eastern Chinese classic but never so good as here, where the shrimp taste fully of themselves and the tea leaves are brightly floral. A tureen of braised duck appears and is quickly divided into four bowls, half meat and half soup, perhaps three spoonfuls of soup in each. 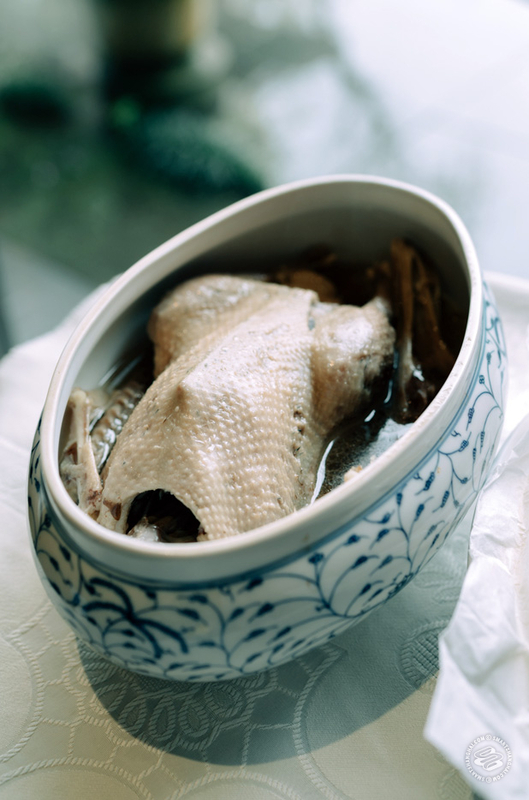 ‘Old duck soup’ restaurants abound on every corner of Shanghai, promising something that only A Dai seems to be able to deliver: a broth whose clarity belies its tremendous depth and flavor. He proudly shares a farming detail that took him and his chef years to pin down: ducks are best in spring and summer, when they are lean; by autumn, their fat obscures any other flavor. A Dai returns to the theme of rural dignity. There is no dish that illustrates this divide more than the one that follows, 舍得, she de, or roughly “give and take”. It’s an excessively indulgent vegetable dish, a dish that requires that his staff go through 15-20 kilos of mao mao cai vegetables to pick out just the two or three center leaves, and discard the rest, for every single dish. Certainly, some of the refuse is used to make preserved vegetables and some to feed animals, but nonetheless, it is both a controversial and a deeply uncomfortable dish to consume. The fact that A Dai holds it up as the symbol for the relationship between rural and urban China seems apt, until you realize he is not talking about exploitation and waste, but, in his theory “give and take”. The dynamics of that transaction remain unclear even as A Dai explains that urbanites pay more (the “give”) and the farmers gain more (“the take”), but the four of us can barely make a dent, after so many dishes. What does it mean to buy 20 kilos of vegetables, have young cooks spend hours picking out their very heart, and then leaving them uneaten on the table? 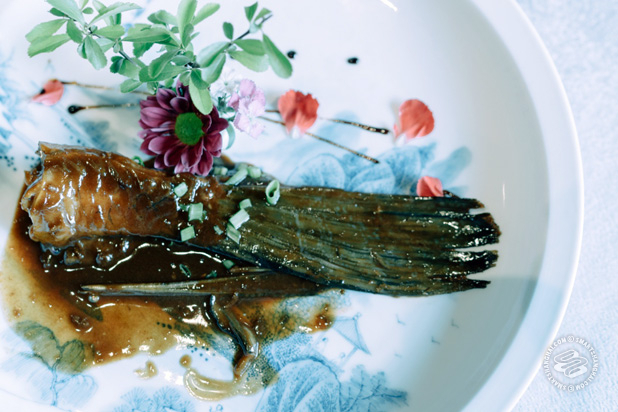 It is no surprise that of all the dishes served at Dragon Well Manor, including many spectacular versions of dishes you may have eaten in the countryside, that舍得has caused the most controversy on the Chinese internet. 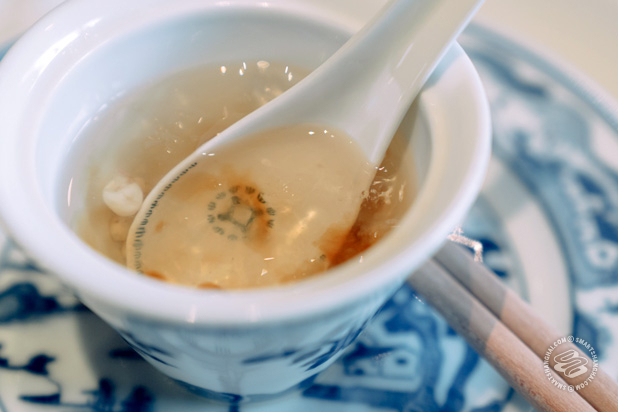 The meal winds down, with a gorgeous clear and syrupy soup, flavored with the sap of the peach tree and chewy ji tou mi, a chewy grain sometimes translated as a Suzhou chickpea. I ask to visit the kitchen. At first, A Dai waves me off, saying there is nothing to see. “People put too much emphasis on the preparation process but ignore the quality of the ingredients,” he tells me, before finally relenting. 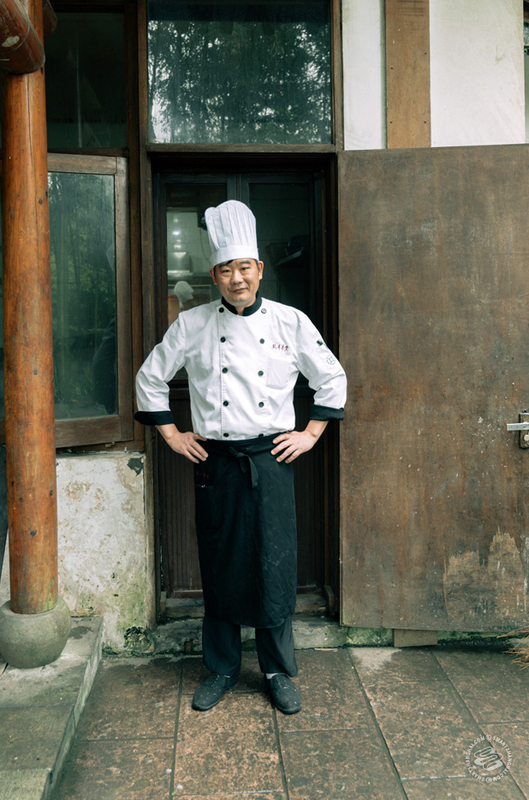 Chen Xiaoming, 45, head chef, leads us along the garden path to a humble building in the back. 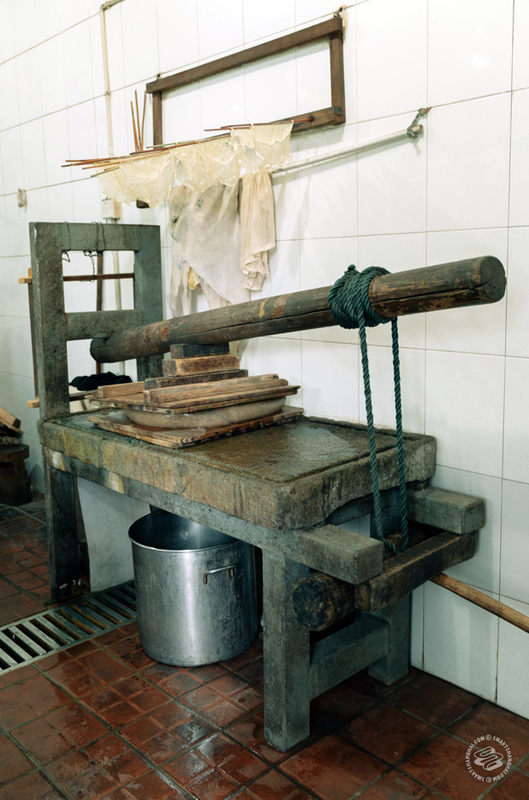 The Dragon Well Kitchen is a simple affair, with an ancient-looking stone press at the entrance and the skins of soy milk drying on dowels (known as yuba in Japanese, or fu zhu in Chinese). Lunch service is almost over and a few of the 18 cooks are milling around. I’m heartened to see how young many of them are, knowing that this generation has the potential to grow up and effect a real change on Chinese cuisine, or at least at a few dozen restaurants. 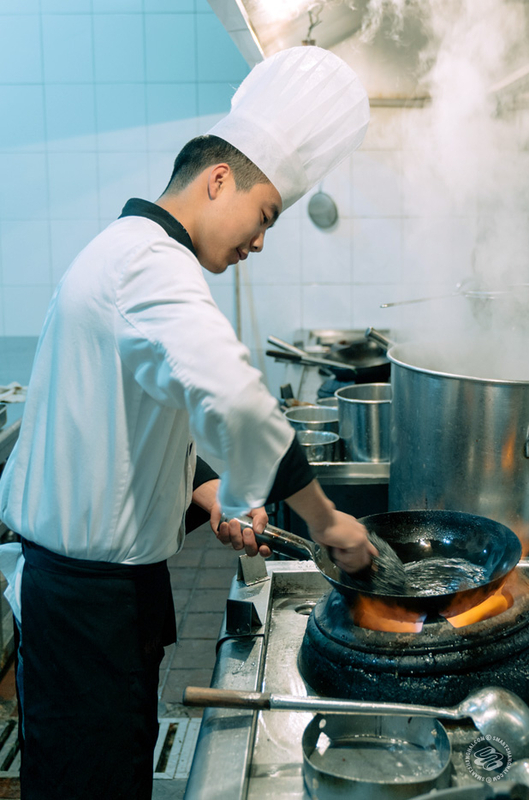 A Dai compares chefs to doctors, able to prevent people from getting sick by following the traditional Chinese way of cooking and sourcing food. This is their academy, the school teaching them to respect ingredients and to make tofu, soy sauce, vinegar and preserved vegetables from scratch. The youth might be alright. If anyone knows the true challenges of China’s food safety problem, it is A Dai. Since establishing Dragon Well Manor in 2004, he has purchased ingredients from some 16,000 small farmers. Some have cheated him. Most have not. A Dai is a city boy, clearly taken by the romance of the countryside but unfazed by its realities. Dragon Well Manor remains a hobby for himself. 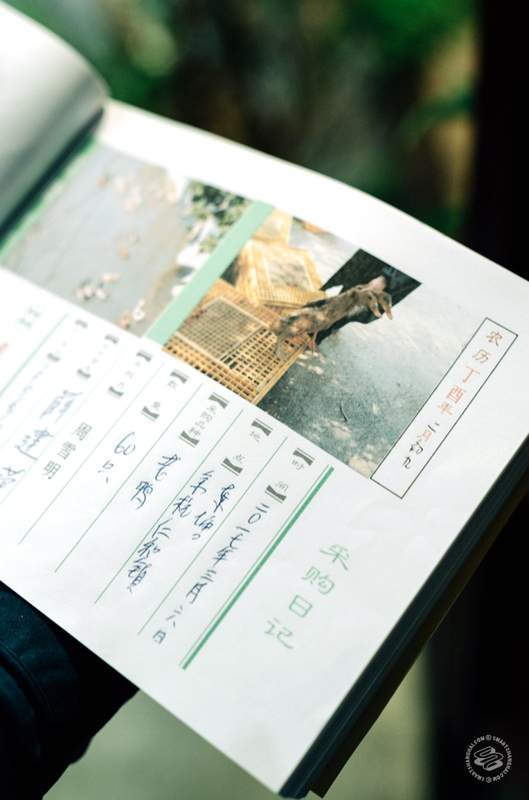 His real social project is the organic farm and school in southern Zhejiang, where he is, in his words, using his money to repair the relationship between urban and rural Chinese. Getting there requires a several hour car ride from Shanghai and then a ferry. A Dai’s utopia is an island. In honor of the occasion, A Dai serves us two dishes that he claims are no longer possible to order on menus in Hangzhou anymore, given their rarity: the tail of the qingyu fish, eaten not for the meat but for the long strips of cartilage between the fins, and a deeply savory soup, made with the inner lining of the turtle shell. 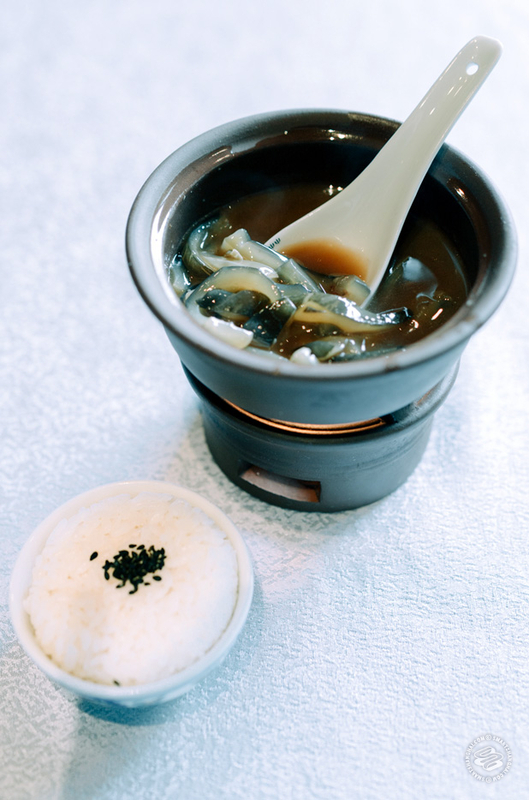 A tiny dish of rice comes on the side to soak up the thick and sticky stock. We go slow, unsure of the turtle and overwhelmed by its richness. A Dai is done in seconds. Dragon Well Manor (龙井草堂) is open by reservation only, 10am-9.30pm for lunch and dinner. Reservations are required. To make a reservation, call 0571 8788 8777. "Expensive"... is a relative thing but here you go: "He jokes that he’s robbing from the rich to the give back to the poor — with dinner at Dragon Well Manor now 1,840rmb for four people, or 3,220rmb for six to eight..."
Has anyone else visited recently? I read some negative reviews on Trip Advisor that seem to indicate the place has gone downhill in recent years.